I am seeing red. 😉 Take a look at the new album I put on the Facebook fan page for Valentine’s Day. Pretty huh? I soooo covet these and I know others will too! Whether or not you have a honey, muffin, or sweetheart, know that I treasure you and send you wishes for a wonderful Valentine’s Day! If your sweetheart doesn't get you something, go treat yourself to something decadent! 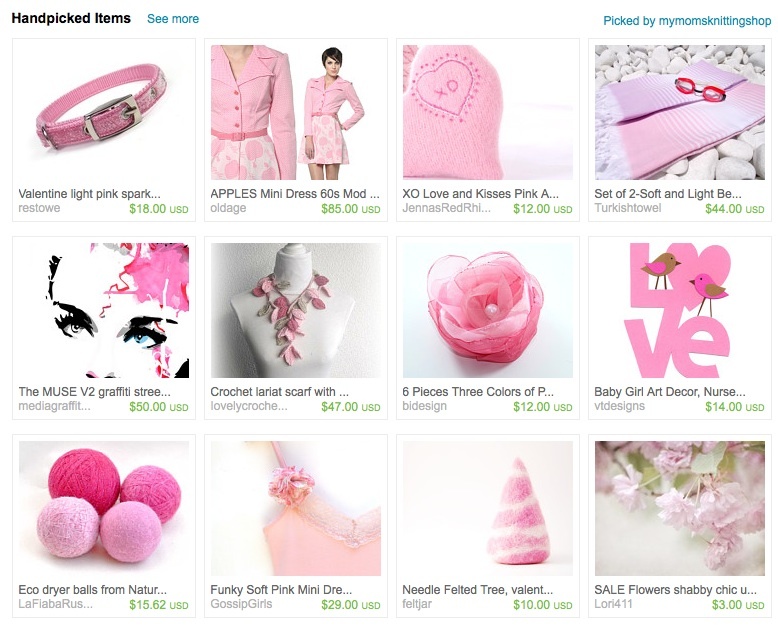 Anyone else notice the home page of Etsy with the top bar for Valentine’s Day suggestions? Have you got your Valentine’s day promotions out? Do you have clutches that can be given as gifts for Valentine’s Day? Here’s a treasury that recently made it on the front page of Etsy that I really liked. Blush pink is just beautiful! There are lots of treasuries being made for Valentine’s Day and I will be making one featuring only clutches. As you know, many items featured in treasuries that make the front get sold! It will feature clutches from some of the clutch makers on the Sellers page. I’ll give instructions and let’s try to get it noticed and in the hands of many!